Jura Lesson with Dme Rolet - Good Food RevolutionGood Food Revolution | Wine is food. Malcolm Jolley gets a mini-lesson in fine Jura Wine from Domaine Rolet. The colour of the Dme. Rolet 2005 Poulsard Vielles Vignes Arbois may have faded, but the wine is very much alive. 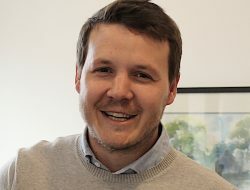 Good Food Revolution has long been enamoured by the wines of Jura, from the foothills of the Alps northeast of Burgundy. 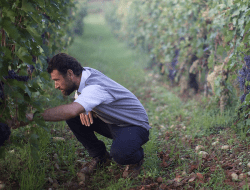 The trouble for me is getting my hands on them since the small allotments of Jura that make it to our market are snatched up our savvy sommeliers and focused collectors. As much as I’d like to crawl from bistro to wine bar every lunch and dinner in search of Poulsard and vin jaune, familial, economic and liver-based factors keep me from it. The result is I don’t taste nearly as much Jura wine as I would like, so on the rare occasions when I do, they almost always show themselves to be revelatory and stir in me both profound pleasure and regret that they’re not a more frequent part of my life. 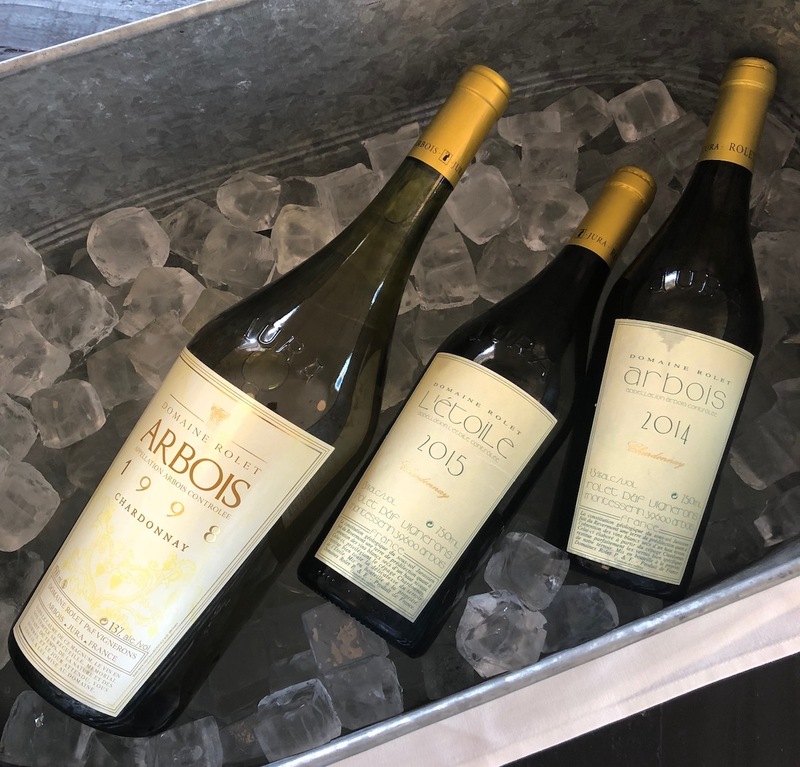 It was with my Jura wine syndrome in mind that I recently jumped at the chance to taste some of them from Domaine Rolet at a tasting hosted by the domain’s Ontario agent, Le Sommelier. The tasting was an informal affair, held over the afternoon with top end sommelier wandering in and out, and saying hello to Ellen Jakobsmeier the Toronto sommelier who moved to France and now works for Genuine Wines, a marketing agency that specializes in helping organic, family owned wineries in France and Italy develop export markets. Domaine Rolet is the largest family owned wine concern in Jura, with 65ha of estate vineyards spread over the four Jura appelations of Arbois, Côtes du Jura, Étoile and Château-Chalon. On hand were a dozen bottlings of their wines, including a pair of Crémants, seven reds and three whites. Although I didn’t taste anything like all the wines made in the Jura, I received a pretty thorough refresher course on the region. I was grateful for it, especially for a reacquaintence with the delicate red grape, Poulsard, which I tasted first that afternoon, along with Chardonnay and Jura’s indigenous white grape Savagnin, in the blend for Domaine Rolet Crémant du Jura Brut NV ($31.95). Wow, this is a lively, crisp and sharp sparkler that woke me up on the first lemony sip. By contrast the Crémant du Jura Rosé Brut NV ($33.95) was fruity and juicy, on the raspberry side of red, made from a blend of Poulsard (50%), Pinot Noir (10%), indigenous Trousseau (10%), rounded out with Chardonnay (25%). What struck me about both was the energy in the glass; not the mousse, it was fine, but the fresh acidity liveliness on the palate. 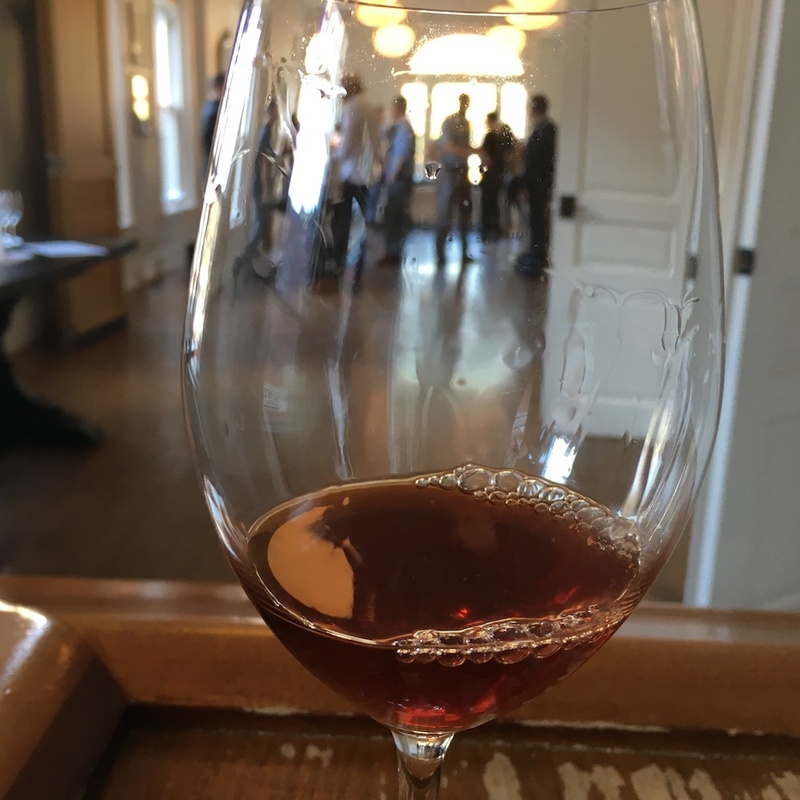 Moving onto the reds, in the style of tasting from another Eastern Fench region known for Pinot Noir and Chardonnay, we began with the Poulsard Vieilles Vignes Arbois Rouge AOP 2015 ($32.95). It’s hard for me to describe Poulsard without mentioning (cool climate) Pinot Noir, and I might have mistaken this wine for it, had I tasted it blind, with lots of high red fruit notes, lean acidity and very fine tannins. The Poulsard showed exceptionally lignt and bright, and my big note on it was “wants lunch”. It’s a food wine for sure. Next up was the ‘Grandvaux’ Côtes du Jura Rouge 2015 ($29.95), a blend of Poulsard and Pinot Noir. I liked this wine a lot, my guess is the Pinot tames the raciness of the Poulsard a bit, so that the wine is both mellow and light and full of long red fruit. Le Sommelier gave out notes at the tasting and the one of them for this wine was from John Szabo MS who wrote, “I could drink this wine all day and night.” So could I. The Grandvaux was in beautiful balance, and was a highlight of the tasting. 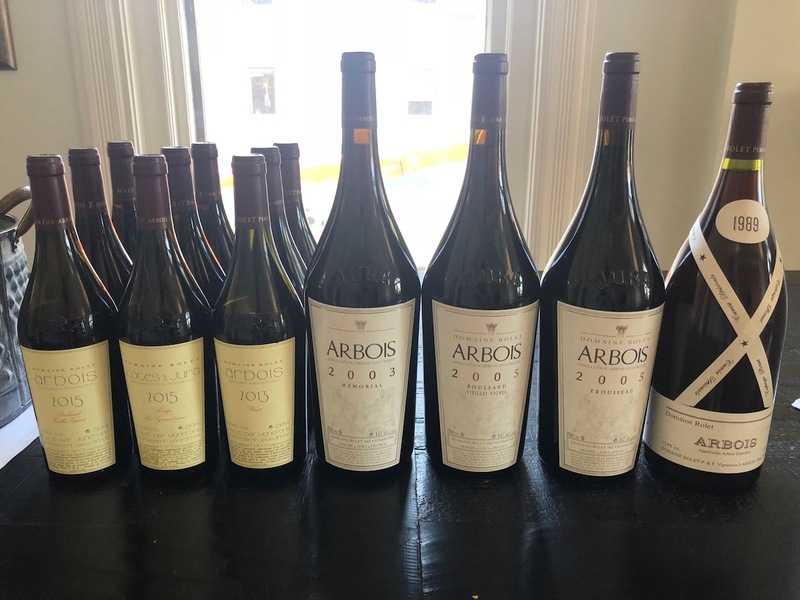 The third wine in first red flight was the Pinot Noir Arbois Rouge AOP 2013 ($33.95), a pale and light wine, that came out like a lighter version of an old school Burgundy. Lovely. Things got serious on the second round of reds, as they were all older and all in Magnum. First the Mémorial Arbois AOC 2003 ($91.95 for 1500ml), a blend of Trousseau, Poulsard and Pinot Noir. This wine was surprisingly and pleasantly funky with mushroom and forest floor notes over its bright red fruit notes. Interesting, complex things were happening on the palate that, I think, would command the attention of any diner. Then, we went back to an older vintage of one of the first reds with the Poulsard Vieilles Vignes Arbois Rouge AOC 2005 ($79.95 for 1500ml). My principal note on the wine is “fun”. Although its colour was fading to garnet, its red fruit was very much alive and the wine was fresh with acidity and salty with minerality and maybe a hint of herb. Also fun was the Trousseau Arbois AOC 2015 with its pronounced note of raspberry and rounder mouthfeel. Finally, we went back to Pinot Noir… way back to the Pinot Noir Cuvée Spéciale Arbois AOC 1989 ($148.95 for 1500ml). Wow, nearly 30 years old but still very much alive with acidity and a spicy character. A treat. To finish the tasting, we tried a trio of whites, all Chardonnay. First the Chardonnay Arbois AOC 2014 ($34.95). Wow. The given note on this wine mentions “crisp acidity” and it’s an understatement. This wine is lively and tart, and also possessed of a salty line of minerality. Just as the Crémant woke me up at the beginning of the asting, the Arbois Chardonnay roused my palate and widened my eyes. Delicious. Next was the Chardonnay L’Étoile Blanc AOC 2015 ($35.95). A little more restrained, austere but also fresh and crisp and mineral. Finally, our tasting of Domaine Rolet ended with a return to the Chardonnay Arbois AOC 1998. What I tasted was ever so slightly oxidated with a note that reminded me of Fino, and mellow yellow fruit that grounded an everfresh line of acidity. A privilege to taste and savour. 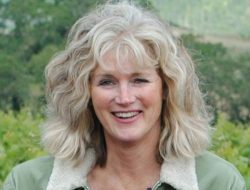 Related post: click here to see Jamie’s November 2017 interview with Ellen Jakobsmeier on the Jura wines of Domaine Rolet.